After three championship saunters to date, Micheál Donoghue could hardly have scripted a better 'dead rubber' in their final game against Dublin. A spot in the Leinster final had already been secured after big wins over Kilkenny, Offaly and Wexford, so the ideal situation was to be pushed all the way by Dublin in their final game in Pearse Stadium and to emerge victorious at the death. His team delivered. It took two Paul Winters goals in the second half to lift the Dublin challenge. They fought hard before the break but lacked the quality to punish the home side; the addition of Eamon Dillon and Winters at the interval improved things. 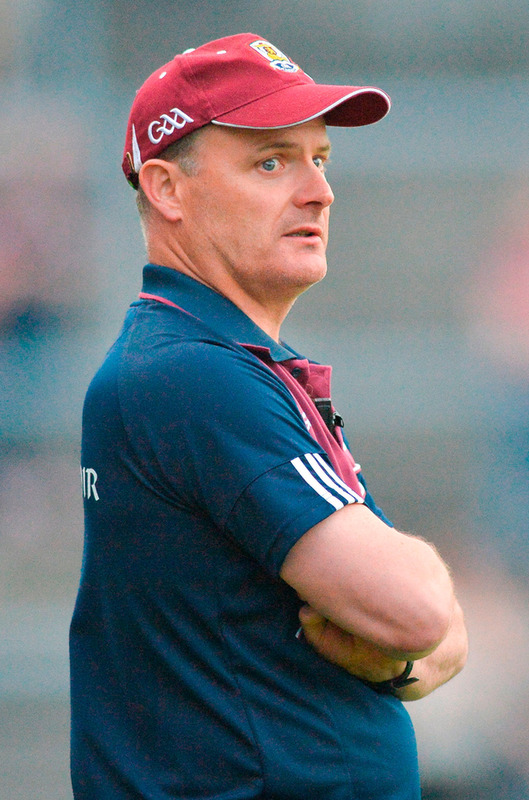 With four wins from four, Galway now face Kilkenny in the final and their manager is satisfied with how their campaign has progressed. "We were quite content," said Donoghue (below). "When they got the goals they stayed in the game well and it was a big challenge for us to come back. But, ultimately, the boys showed good composure and confidence and we eked out the win. "When the goals came, it gave them a huge lift. We were five, six or seven up and the goals cut that down to the minimum. We had to work hard for it. When they got the goals, their tails were up. But testament to our boys, they worked hard and stayed in the game when the chances came." Galway were guilty of some slack defending for the two goals though. 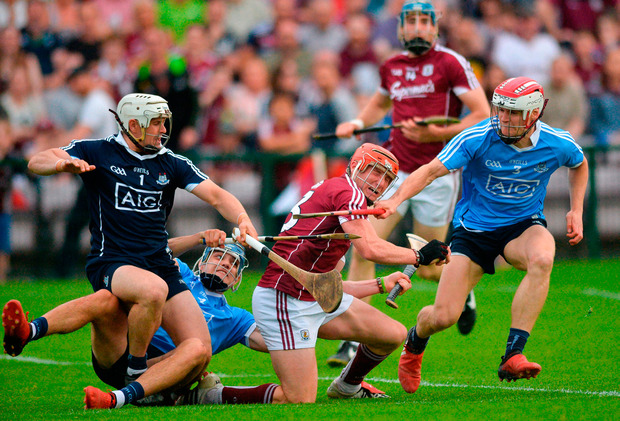 The first, after 39 minutes, was finished off by Winters after James Skehill misread a long ball into his square, while the movement of the Dublin forwards and Galway's poor decision making allowed Winters to crack goal number two. A couple of long-range frees form goalkeeper Alan Nolan saw Dublin take the lead, but the home support was relieved to see David Burke and Jason Flynn step up with the winning scores late on. At the break the game seemed to be destined for another Galway landslide victory. Flynn and the excellent Conor Whelan had helped their side to a 0-16 to 0-9 lead, while Padraic Mannion and Joseph Cooney also got in on the scoring. However, Dublin had the game's outstanding player in Rian McBride. He hit four of his side's total and kept them in touch at the break with a couple of good scores. It was the Vincent's midfielder who launched the comeback with a sweet sideline cut after the break but, despite being pipped at the post, his manager can still be satisfied with their season. "We hadn't performed at all in the first half," said Pat Gilroy. "It was a great turnaround in the second half, the effort from the lads was incredible. We got the goals at important times but it's disappointing we didn't push on and get the victory. "It has been a massive improvement but it's a results business and at the end of the day we only won one out of four games here in the championship. There is a good base to build from. But we have got a mountain to climb because we have got to be winning games." Scorers - Galway: J Flynn 0-11 (9f); J Cooney, C Whelan, P Mannion 0-3 each; C Cooney, David Burke 0-2 each; S Loftus, C Mannion 0-1 each. Dublin: P Winters 2-1; D Treacy (0-3, 3f), R McBride (0-1 sl) 0-4 each; P Ryan 0-3 ( 0-3f); A Nolan 0-2 (2f); D Sutcliffe, J Malone, S Moran, J Madden & C Boland 0-1 each. Galway - J Skehill 5; P Killeen 6, Daithi Burke 7, A Harte 6; P Mannion 9, G McInerney 7, J Hanbury 5; S Loftus 7, David Burke 7; J Cooney 8, C Mannion 8, N Burke 8; C Whelan 9, C Cooney 7, J Flynn 9. Subs: E Burke 6 for Loftus (43), S Cooney 6 for Killeen (50), D Glennon for C Cooney (68), P Brehony for J Cooney (73). Dublin - A Nolan 8; P Smyth 7, C O'Callaghan 8, E O'Donnell 6; S Barrett 7, S Moran 7, C Crummey 6; R McBride 9, T Connolly 5; J Malone 7, F McGibb 8, C Boland 7; D Treacy 7, D Sutcliffe 8, P Ryan 5. Subs: E Dillon 7 for Connolly (35), P Winters 9 for Ryan (35), C McBride 7 for Boland (47), J Madden 6 for McGibb (65), J McCaffrey for McBride (73). Ref - D Kirwan (Cork).